GAUSSIN has designed and delivered more than 50,000 vehicles worldwide for more than 1,500 customers in 50 countries to meet the global need of heavy, difficult or cumbersome goods transportation. 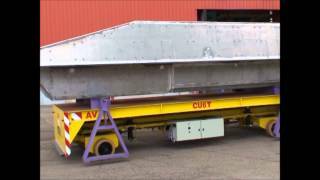 Trailers Gaussin trailers are renowned throughout the world for their robustness. From 1 to 300 tons, Gaussin proposes a solution for each type of goods, whether heavy, difficult, cumbersome or dangerous. Self-propelled Gaussin designed more than 300 self-propelled for different applications. Working with us is trusting in a centenary experience in solving sharp handling problems. The technical challenges of our customers push us to innovate every day to propose efficient solutions, ecological and guaranteeing a maximum level of safety. HIT, HEAVY INDUSTRIAL TRANSPORTER, is a self-propelled transporter dedicated to transport long and bulky loads. The vehicle is equipped with an ergonomic driving cab (from the ATT range of port vehicles). HHT - Heavy Handling Transporter, is a self propelled multimode transporter with 300 tons capacity. The TT Gaussin is the perfect combination with terminal tractor for the transport of ISO containers. The ACM - Automotive Container Mover, is a self-propelled U-shaped machine for transporting 25-ton containers. ATT®- Automotive Terminal Trailer" - is the answer to the growing need for a multipurpose, upgradeable, powerful, reliable, high per­ formance vehicle to - quickly - handle port operations. The AMTS Automated Multi Trailer System is a version of the ATT vehicle, a revolutionary vehicle for port operations. The AMTS can carry 2 to 4 ISO containers on a single trip.